Taipei, Aug. 31 (CNA) As China continues its military buildup, it has demonstrated that it has the ability to seize air supremacy over areas west of the "first island chain" and is gradually gaining the ability to take control of the Taiwan Strait, according to report Thursday by Taiwan’s Ministry of National Defense (MND). The Chinese military’s joint intelligence, monitoring and reconnaissance capability currently covers areas west of the "second island chain" in the Western Pacific, which is enough to support all sorts of military actions within the region, the MND said in a five-year military development plan submitted to the Legislature. The report said Chinese bombers and fighter jets have been crossing the "first island chain" into the Western Pacific regularly, which constitutes a direct challenge to the U.S. military presence in the Asia-Pacific region and demonstrates China’s ability to achieve air supremacy in areas west of the island chain. The "first island chain" refers to the major archipelagos on the East Asian continental coast, and comprises the Kuril Islands, the Japanese archipelago, the Ryukyu Islands, Taiwan, the northern Philippines and Borneo. The "second island chain" comprises the Bonins, the Marianas, Guam and the Palau archipelago. The island chain strategy was first mentioned by American foreign policy commentator John Foster Dulles in 1951 during the Korean War. It is now often used in political and military analyses of China’s military movements in the Western Pacific. With regard to sea combat capability, the report said, China has been conducting far-sea training, using its first operational aircraft carrier, the Liaoning, as part of its efforts to gradually increase its ability to take control of the Taiwan Strait. Meanwhile, the Chinese army has been sharpening its preparedness against Taiwan via landing drills and has developed the ability to seize Taiwan’s offshore islands, the report said. It said China already has short- and medium-range missiles that can reach any part of Taiwan and is now developing long-range missiles capable of countering foreign military forces. 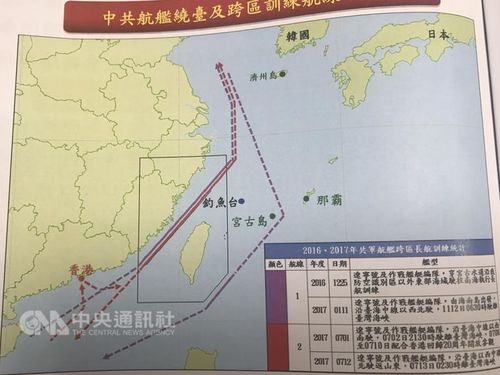 In another annual report on China’s military power, the MND said that in the period Aug. 18, 2016 to Aug. 9 this year, Chinese military aircraft skirted Taiwan’s Air Defense Identification Zone 16 times during their far-sea flight drills, in a bid to intimidate Taiwan. Between Dec. 25, 2016 and July 12 this year, the Liaoning conducted four drills in waters near Taiwan, including in the Taiwan Strait, according to the report. It said any military action by China against Taiwan is likely to take the form of deterrence, blockade and live fire, with all branches of its armed services involved. In the future, China might also increase its non-traditional combat operations, such as cyberattacks and electronic warfare, against Taiwan, the report said. It also outlined seven scenarios that could lead to China using force against Taiwan, starting at the top with Taiwan declaring independence, moving unequivocally toward independence, facing domestic unrest, or acquiring nuclear weapons. The other three factors mentioned were a delay in cross-strait dialogue on peaceful unification, foreign intervention into Taiwan’s internal affairs, and foreign military presence in Taiwan.